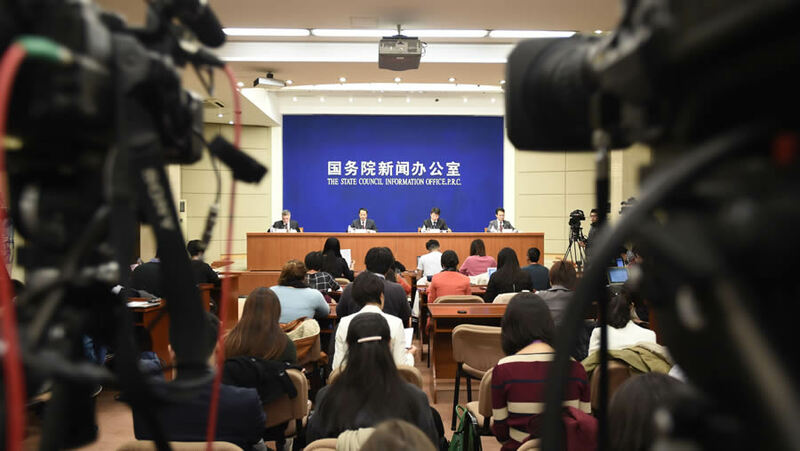 A media briefing of the China two-child policy is held at the State Council Information Office on November 10, 2015 in Beijing, China. A National Protest of Planned Parenthood was held Saturday, April 23. Reggie Littlejohn, President of Women’s Rights Without Frontiers, spoke at the protest site in Concord, Calif., She detailed her conviction that, posturing as a champion of “choice” in the US, International Planned Parenthood’s true colors show boldly elsewhere on the globe, particularly the People’s Republic of China. In China, abortion has little to do with a woman’s choice. The world was shocked in 2012 when WRWF released the photograph of Feng Jianmei lying next to her forcibly aborted baby, showing to millions the true face of the Chinese Communist Party. Meanwhile, International Planned Parenthood is not merely present in China, but their affiliate organization literally works in tandem with the government’s coercive One Child (now Two-Child) Policy. In its first decade, in collaboration with IPPF, CFPA boasts it established a branch in almost every village in China and mobilized as many as 94 million members and volunteers. In fact, China was the second country after New Zealand to become officially recognized as a qualified member of the International Planned Parenthood Federation (IPPF), after CFPA met IPPF’s 65 criteria on sexual and reproductive health issues. All the while, the CFPA was implementing a program that was forcibly aborting and sterilizing women. Nor is this collaboration on International Planned Parenthood’s part an artifact of the past. Today IPPF is still CFPA’s main international supporter, and its executives have gone on record praising the achievements of China’s notorious One Child Policy. China’s family planning office, in turn, has expressed the importance of international cooperation for maintaining control over population levels. In a 2011 letter to the editor, former Planned Parenthood Executive Vice President Norman Fleishman called China’s One Child Policy a “start” to curbing global population. IPPF’s site points to CFPA as its main operations hub in China and has recently publicized its good relationship with the Chinese government. In 2013, following a change in China’s leadership, IPPF described its meeting with new Chinese premier Li Kequiang and mutual plans to “strengthen the partnership” between China and IPPF. If Planned Parenthood stands for ‘choice,’ then why are they working hand in hand with the Chinese Communist Party’s coercive population control machine? Learn more about the “Save a Girl” Campaign here. Sign the petition to end forced abortion here. Watch the video, Stop Forced Abortion: China’s War Against Women. Originally published at Women’s Rights Without Frontiers on April 28, 2016. Republished with permission.